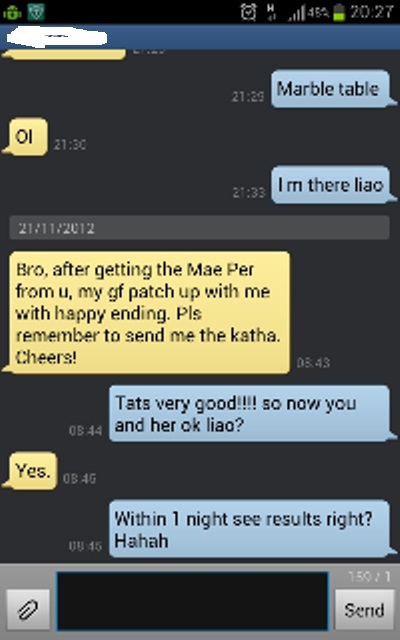 Bro, after getting the Mae Per from u, my gf patch up with me with happy ending. Pls remember to send me the katha. Cheers! Above is a feedback by a buyer who managed to get back his lover within 1 day after using the charm which he got from me. Results vary for different persons. The most important point here is that the he got results without chanting. I had indicate a few times in my blog that my amulets will work without any chanting or prayers from the buyer. I always questions the masters, if an amulet need the buyers to chant to has effect, then why do we need the masters???? If my amulet need a buyer to chant on the amulet to has effect or become powerful, then the amulet is powerful because of the buyer effort but not the master power! This is common sense. Thus, I always get effective and powerful amulets that is already well blessed by powerful masters. How to know whether they are powerful? That's my job! I had to ensure they are powerful and skillful and the amulets are really good! fake master: this charm is very powerful. make from human ash! me: what human ash is inside? fake master: is make from human ash who die in prison due to dead penalty. I stand up and walk off. He thought I am stupid. A human ash who who die in prison due to dead penalty is good for magic attack. Functions like the Black Warrier I sold on my blog few 18th september. I cant imagine the unlucky buyers wear this to go gamble and end up losing more! True enough, after a few days, I get to know of a thai person who got the thai amulet from him told me that he lost his 1 month salary in the underground casino. Therefore, I don't blindly believe in masters! Any person can just shave their hair and wear a monk robe and claim that they are monks or masters!